Romhacking.net - Review - Must have! 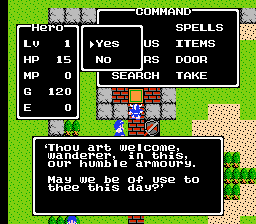 This is a hack that ports over Square-Enix’s official script from their mobile remake nearly perfectly (give or take about 5% due to technical limitations). The rom is expanded, doubling the script size! 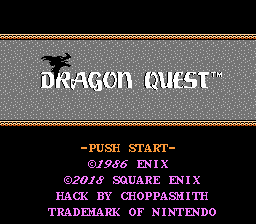 The title screen is altered to say DRAGON QUEST. 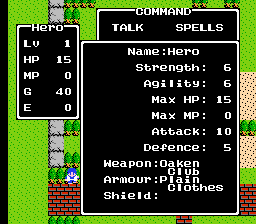 Monster, Item, and Spell names match current DQ Localization standards. 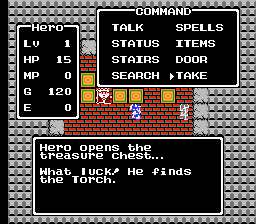 Made with the PRG0 dump of the game, but should work on the PRG1 version as well. As of the 1.1 update, the patch is in Xdelta format, you will need a program like deltapatcher to apply the patch. As somebody who played through the mobile port of this game about a dozen times (it’s a cool game for commuting) I highly recommend checking out this translation. 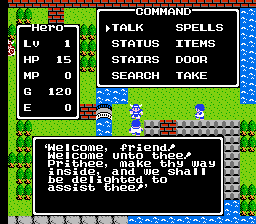 It’s not exact as it’s obvious the translator would be unable to code NPC’s and events that were added in the mobile port, but you’re not missing anything. And if you want the “QoL improvements” added in the mobile ports (doubled exp/gold) you’re better off playing the mobile version.